Twitter Planning to Lift 140 Character Restriction... But How? 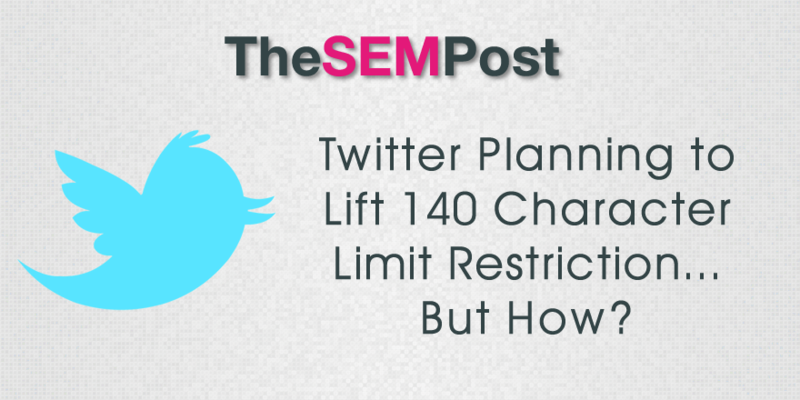 You are here: Home / Twitter / Twitter Planning to Lift 140 Character Restriction… But How? Twitter Planning to Lift 140 Character Restriction… But How? Twitter is looking into making changes that make the social media platform unique – a change that would see the limits raised beyond their usual 140 characters in a tweet. Depending on how this is implemented, it could fundamentally change how Twitter works and how users consume tweets. Currently, there are third party services that allow users to “tweet” more than 140 characters, such as using an image of a longer piece of text or by linking a secondary page that contains the tweet beyond the 140 characters. Twitter has experimented with allowing addition information in tweets… such as the change they made recently that allows users to quote a tweet, then allow their own additional tweet which is tied to the retweeted tweet. They have also added various Twitter cards, which also allows users to present additional information. The change Twitter made recently to remove the 140 character limit on direct messages led many to believe that Twitter could be loosening the restrictions on tweet character counts, but at what expense? Twitter could definitely alienate users who like the limit. How could Twitter implement it? They could simply make the 140 characters more useful by no longer including the characters for a link or image as part of the 140 characters. They could also remove the character counts for Twitter handles as well – another way that tweets eat up characters, especially if multiple handles listed in a single tweet. We have seen them do something somewhat similar with Twitter images, where users can tag an image with a Twitter handle without using up characters. Another way would be an option for a user to click through to a tweet and read the tweet beyond the additional 140 characters. But that would also require users to click through, something that might not get done regularly, and it could lead to problems where people don’t intend to go over the 140 characters but accidentally do. Re/code doesn’t note a timeline for when they expect Twitter to announce the change, but it would presumably be soon.